The day I got the call to audition for Herbie Hancock’s band was one of the most exciting days of my life to this moment. Herbie played great, and with such a strong spirit, that it took my breath away. He listened so closely! I was able to play all of my ideas without the slightest interruption in the flow. It was effortless. This was a very creative time for Jazz music in America. Jazz, Rock, Funk, Soul, and African rhythms were all starting to meld into one another. The existing rules didn’t apply anymore; it was total spontaneity and improvisation. There was no real precedent set or parameters to conform to. We just went for it. Each new Jazz record that came out pushed past the boundaries of the preceding one. We couldn’t wait to hear what Miles, Tony Williams or Chick Corea was going to do next. It was as if the dam had broken, and creativity was just spilling out all over. At that time, my close friend, bassist Paul Jackson, and I had developed an uncanny ability to communicate on the bandstand by creating our own musical language concerning Jazz and Rhythm & Blues. We devised a sort of dot and dash rhythmical system that enabled us to displace any note we wanted, at any time we wanted, so that no one knew where the one was but us. It was actually telepathic; it was not worked out. The first time we played with Herbie was as a trio. As soon as we started playing, it was as if we went into “warp speed.” He immediately perceived what Paul and were doing, and took it to another level in the first eight bars. It was as if we were all soloing simultaneously. And because we all really listened to each other, it was not congested. It was true improvisation, with all the funk and fire one could desire! We played like this for about twenty minutes. Afterwards, Herbie stood up, put on a long black Coat, walked past me and simply said, “We’ll be leaving for Chicago on Monday.” Then he walked out the door, silently, looking like Darth Vader. Then I was to meet Bennie Maupin. A man of great strength of character. He could play as hard as you wanted for as long as you wanted or be poignantly mellow and soulful. Bennie’s musical statements could be deeply haunting with tremendous restraint, plus he could really play the blues. We toured for three months and it was fantastic. What an education! I learned more about swinging, Jazz and life on the planet in those three months than had in the prior twenty-six years. It was also at this time that Herbie and Bennie introduced me to Buddhism, which really opened my eyes. The following tour, I met Bill Summers, an ethnomusicologist. His knowledge of music, rhythm and folklore of the world is incredible. He is particularly astute in African drumming. Bill is a master percussionist whose orchestrations are fascinating. He’s like an alchemist, transforming the sounds of the ancients into something applicable to modern music. He’ll hear something and respond instinctively with something that fits perfectly, and is fun to listen to. His drumming can be fierce! We went on the road with this group of musicians for six months. The record Head Hunters was doing very well and we were playing to capacity crowds in theaters, at festivals, and in coliseums. There were lines around the block to hear us play. Every night there would be a new innovation by one of the band members and we were doing things musically I’d never heard before. Herbie would push us forward, demanding that we break free of constraints of the tradition and try new ideas. I couldn’t wait to get to the gig to try new stuff. The audience became aware of what we were doing and seemed to try to anticipate our next move. Once I checked into a hotel and heard a band in the lounge trying to sound like us. That was when I realized something unique was happening. We returned to the Bay Area to record Thrust. We started out with “Palm Grease.” Herbie sort of wrote this around a groove that Paul and I were playing at a sound check on the road. Bill came up with a Latin-flavored break. This song used to get good and funky and lay deep in the cut. Paul came up with one of his signature Paul Jackson bass lines. Let me say here, when people the world over think of the Headhunters, they think of Paul Jackson’s revolutionary bass-playing. He introduced an entirely new sound to the music, which is recognized and emulated to this day. When we recorded it, this one went down real easy – in one take. Years later, some of the great drummers like Dennis Chambers, Jeff “Tain” Watts, and Kenny Washington would play the drum intro of this tune when I walked into clubs at their gigs – as a way to say hello or give me props, I guess. I have to admit it makes me proud. I dig it. “Actual Proof” was to originally be called “The Spook Who Sat By The Door,” from the movie soundtrack. I’m proud of the role I played in helping this classic come to fruition. The producer had asked me to play a rhythm I would have turned my nose up at in the eighth grade. I responded that I wanted us to share the interactions and conversations that were going on inside the groove, in the tradition of Elvin and Trane, or Miles and Tony. At this, the producer became enraged and replied that we had one take, one chance, to do it our way, and if we failed, we had to do it his way. The following day we did “Butterfly.” This tune has a very sensual mood and drips with wet colors, like a rain forest. Herbie really enjoyed writing and playing lush ballads like this. His playing here is simply beautiful. Bennie’s work here is provocative. His solos are soaked through with deep emotion and reveal his to be one of the most profound voices in jazz. Bill’s conga-slides at the start are a legendary part of the arrangement. Later Paul and I go into our thing with a double-time section. That same day we recorded “Spank-A-Lee.” This was a tribute to the type of funk that was coming out of Oakland, California in the early seventies. Paul, Bill and came from Oakland, and since the three of us were on the ground floor, so to speak, of laying down this style, Herbie thought it would be fun to play one of these grooves. Herbie and Bennie are smokin’ all the way on this one. 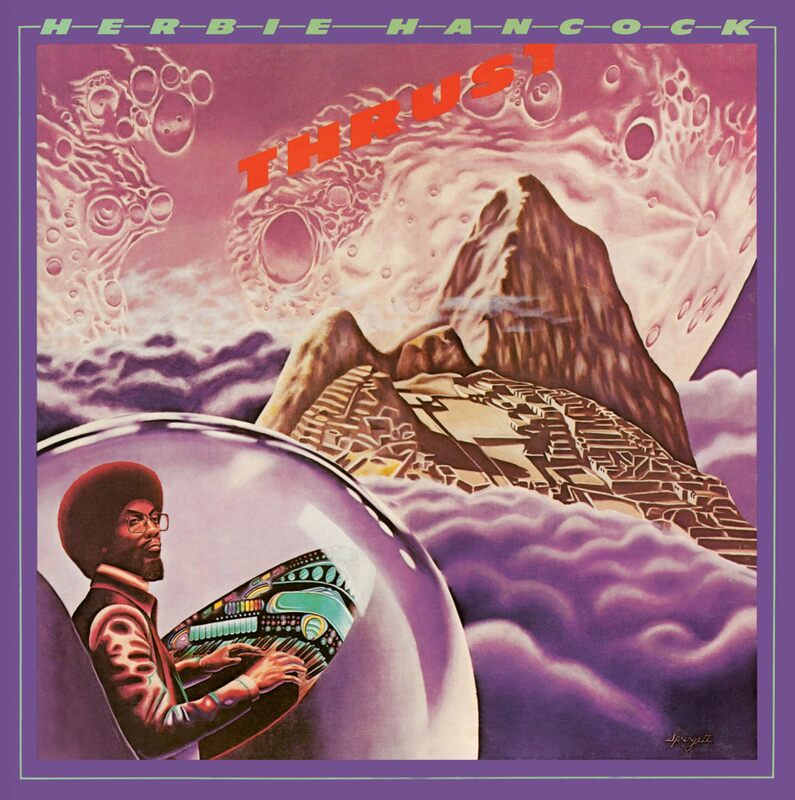 Produced by David Rubinson & Herbie Hancock for David Rubinson & Friends, Inc. Recorded and mixed 1974 by Fred Catero at Wally Heider Studios, S.F. – Live versions of “Actual Proof,” “Spank-A-Lee,” and “Butterfly” appear on the album Flood. ARP Soloist – ARP’s monophonic analog synthesizer featuring 30 preset sounds and designed to sit on top and accompany an organ. This instrument can be heard on several of Herbie’s albums including Thrust.